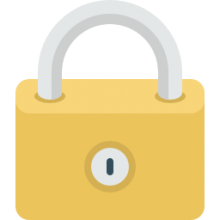 In this post, we examined five of the best-selling padlocks. Padlocks are small locks that have been in use for centuries to help secure belongings and keep out intruders (Source). Most padlocks use a key to open, while others rely on a combination system. Combination locks use a wheel that drives a cam. This turning allows a drive pin to make contact with the wheel fly on the nearest wheel. Once you turn the dial in the correct combination, the lock opens. A key padlock uses a pin and tumbler system. The teeth and notches of the key move the spring-loaded pins within the lock to open it. Modern locks now use technology such as Bluetooth to open (Source). Before buying a padlock, experts recommend taking an inventory of the items you wish to secure and determine their value. The higher the value, the better the lock you’ll want to buy. Another thing to consider is your insurance. Some insurers specify that a lock must meet a specific rating when it comes to whether they’ll insure your valuables (Source). Master Lock is a well-known lock maker, and their 4400D Bluetooth lock is an ideal choice for student lockers and indoor use. This lock is 1-29/32 inches wide. To open this lock, use your smartphone to enter a code, or you can also use the directional keypad on the lock if you don’t have your phone with you. What’s nice about this lock is that you can share access temporarily with a friend or family member. Lion Locks makes a 1-9/16 wide, keyed padlock that comes in a convenient 12 pack. This lock’s hardened steel shackle makes it difficult to cut. The 4-pin cylinder and dual locking levers make it tough to pick. Lastly, these locks use a proprietary coating that prevents rust, which makes them ideal for outdoor use. Next is the Master Lock 1-9/16 inch wide vinyl covered lock. This lock’s core is aluminum, but the vinyl coating makes it corrosion resistant and lessens the chance it’ll scratch. Like the other locks, this is ideal for securing everyday items like backpacks, trunks, and lockers. The 4-pin cylinder makes it resistant to picking, and it comes with two keys. Master Lock’s 1-3/16 inch padlocks also feature their vinyl coating over their aluminum core. This pack comes with four locks that are unlocked via a key. Like the previous models, these locks are ideal for securing smaller, less valuable items such as you would store in a locker, backpack, or trunk. The vinyl coating makes them suitable for indoor and outdoor use. Comes with four locks and two keys. 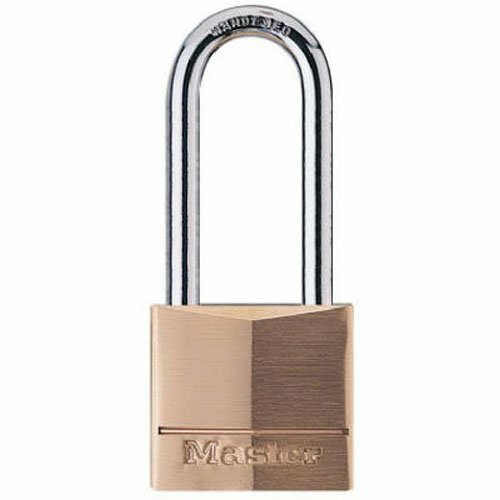 Last up is the Master Lock solid brass 1/9/16 inch lock. The brass design makes it useful for both indoor and outdoor applications. It uses a 4-pin cylinder and dual locking lever mechanism that makes it difficult to pry or pick. Comes with one lock and two keys. This padlock offered by Master Lock is well-made, secure, and suitable for securing briefcases, backpacks, lockers, and more. Users love the price and the solid brass construction, but some do note that it rusts. The Master locks feature a hardened steel shackle to discourage cutting attempts, a rust-resistant body, an extended shackle length for flexibility, and a 4-pin cylinder. Another great thing about this product is that it has a dual locking lever mechanism to prevent anyone from picking up the lock. The package includes two keys, and the product is available in two models – 1-1/2” and 2”. As a whole, buyers have a high opinion of the Master padlocks, and they highly recommend it as one of the best locks available. A reviewer comments that he is satisfied with the quality of the product and that it keeps his valuables safe. He adds that it probably won’t hold back a determined burglar, but it looks sturdy and durable. Another user shares that he uses the device to secure his gate and that he hasn’t had any accidents. A purchaser also observes that the lock seems well-designed and that it serves its purpose well. However, a couple of customers have noted that they think the padlock is not very secure and can be easily unlocked. 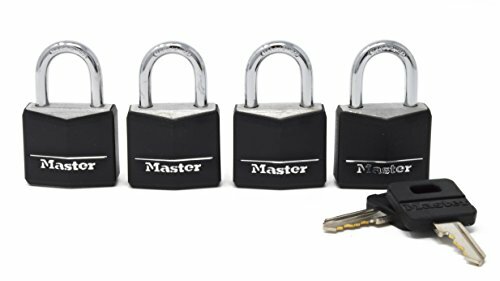 If you are wondering how to keep your lockers or backpacks safe, you can try this padlock set offered by Master Lock. Users love that the keys are keyed alike, but some do note that they are smaller than expected. The Master Lock set features four padlocks with a black vinyl-covered aluminum body, which is scratch/corrosion-resistant, in addition to a hardened steel shackle (5/8” in length) to keep thieves away. Another great thing about this product is the 4-pin cylinder in combination with the dual locking mechanism, which will make picking it up difficult. What’s more, the package includes two keys with matching color heads for convenience. A reviewer comments that he bought the set to secure his bike and that he is satisfied with his purchase. He adds that the padlocks will not keep a determined thief away, but they are well-made and he hasn’t had any problems with them. Another purchaser shares that he likes that they are keyed alike, but he would have preferred if they came with more than two keys. A buyer also states that the locks arrived quickly and that they work just as he expected. He highly recommends them as the best padlocks for lockers. However, a couple of customers have noted that the set is not very useful for outdoor use because the locks will rust. Some also complain that the padlocks are too small and flimsy. 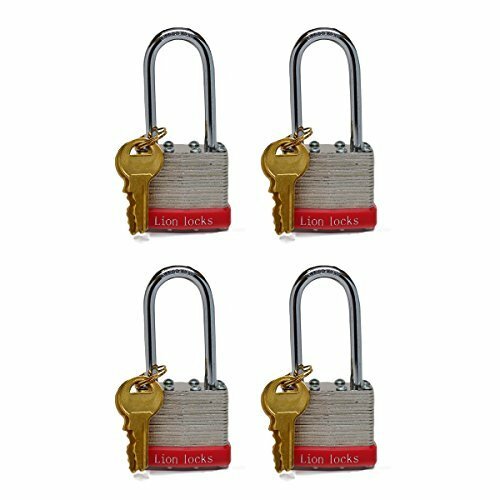 This padlock offered by Lion Locks is solid, sturdy, reliable, and available in one per pack, four per pack, and 12 per pack. Users love that the padlocks in the sets are keyed alike, but some do note that they are too small for their liking. The Lion Locks keyed-alike padlocks feature hardened steel shackle (2”), which is designed to be cut-resistant, a 1-9/16-inch body, a 4-pin cylinder to prevent lock picking, and dual locking levers for extra security. Another great thing about this product is that it’s rust-proofed so that you don’t have to worry about it getting stuck. If you order the 12 pack, you’ll get 12 keys. As a whole, buyers have a high opinion of the Lion keyed-alike padlocks, and they are satisfied with their design, functionality, and sturdiness. A reviewer observes that he has been using them for a couple of months and that he hasn’t had any issues. He adds that you’ll have a hard time trying to break one and that they are perfect for doors and gates. Another user shares that the product seems well-made and that you can spray it with graphite to prevent rusting. A purchaser also comments that he likes that the packages include so many keys and that it’s perfect if you need many locks on a single object, but don’t want to waste time finding the right key. However, a couple of customers have complained that the locks are too flimsy and cheaply made and that they are smaller than they appear to be. 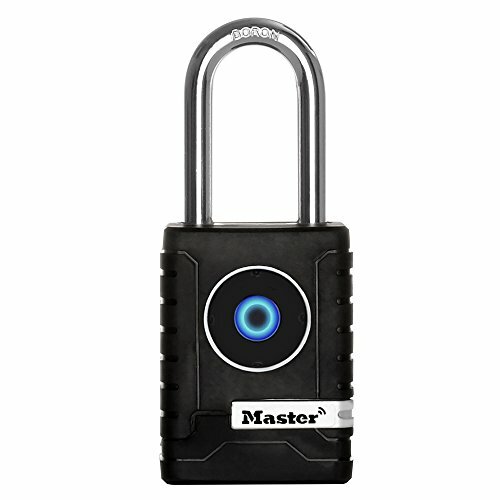 If you want to keep your belongings secure, you can try this Bluetooth padlock offered by Master Lock. Users love the innovative design, but some do note that the app is not user-friendly. This Bluetooth locking device features a metal body, a boron carbide shackle, an anti-shim locking mechanism, military-grade authentication/encryption, and it’s available in an indoor and outdoor model. Another great thing about this product is that you can use it to share temporary/permanent access with friends or co-workers, monitor activities, and receive alerts. You can either use your smartphone to unlock the locks or enter a code on the keypad in case you lose your phone. In general, purchasers have a mixed opinion of the Bluetooth padlock, and they agree that the design needs improvement. Some of them share that it’s nearly impossible to unlock the padlock with the phone and that it fails to work more often than not. An unhappy buyer shares that he had to cut the shackle after numerous unsuccessful attempts and that it’s not reliable at all. Another user also states that he likes the idea, but the Bluetooth is hit and miss, and the app is not functioning properly. On the other hand, a happy customer mentions that the padlock is strong, heavy, and sturdy and that it has been working well for a couple of weeks. 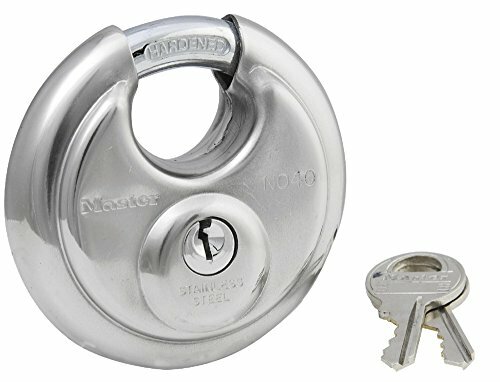 This stainless steel padlock offered by Master is well-made, durable, affordable, and excellent choice for storage units, garages, and sheds. Users love the price and the quality, but some do note that the key is flimsy. The Master discus lock is suitable for indoor and outdoor use, and it features a stainless steel construction (2-3/4” wide) with a hardened steel shackle (5/8” in length) for maximum strength and security, and a 4-pin cylinder in combination with a dual locking mechanism. Another great thing about this product is that it has a shrouded design to minimize and reduce the chances of it getting cut. The package also includes two keys. A reviewer comments that he likes the solid construction and that it’ll be very hard to cut the shackle with bolt cutters. He adds that the mechanism something gets stuck, but he is happy with his purchase and finds it perfect for PODs. Another user says that he feels that his belongings are safe thanks to this discus padlock and that you can hardly find something better if you’re looking for affordable padlocks. A buyer also observes that he hasn’t had issues locking and unlocking the device and that he couldn’t be more satisfied with it. However, a couple of customers have complained that the locks they bought malfunctioned pretty quickly and that sometimes it’s almost impossible to unlock them with a key. Some also point out the locking mechanism could be picked up very easily. Over in Reddit one user wondered which padlocks with the same key are the hardest to break? This college student was interested because he lives out of his backpack and wanted to purchase and especially secure combination style option to use at a gym. A user recommended high-security options (from Home Depot & Walmart)- saying that in general the more you spend a better quality that you’ll get. Another rule of thumb, when you end up purchasing shouldn’t cost more than what you are protecting with it. For example, if your safeguarding pricey electronics equipment or ultra expensive Apple products, it makes sense to purchase something that costs over $200. But if you’re locking away some old gym clothes and scratched CDs, then it doesn’t really make sense to spend too much money on one. One user did recommend the Master Lock speed dial, though he also liked Keyed Alike products. They even recommended an aftermarket modification- adding some epoxy onto the one-way screw on the back. He even says that professional lock picker is haven’t found a way to bypass it, at least without destroying it. That said, thieves aren’t going to spend a lot of time picking a lock if they can just destroy it. This user also said that because this particular style of lock is not especially heavy duty or rugged, and has a pin shackle, in all likelihood if someone attacked it with a small bolt cutter or hammer it would probably break. He recommends purchasing options that have hardened thick shackles and not to be as concerned with pickability. Another user asked where the original poster was located. He says that, surprisingly, a bunch of different locks are only available for purchase and specific countries. For example, he purchased a ABUS Titalium 80TI/40 with a keyway and its enhanced internal security mechanisms that are great at preventing that. But make sure you don’t forget the key- otherwise you might need to use a right angle drill to break it open! Another poster wondered whether you could find a high-quality padlock for cheap. In his particular case, he is traveling internationally with some pricey firearms and needs to store them in a hard-sided, locked case. One of the top recommendations was the non-shimmable American 1100. Because this particular brand of lock has an especially thick shackle, it would force thieves or the TSA to actually destroy the case itself rather than attempt to break through the lock. Another useful suggestion came from a user who said that to make it extra tamper-proof, you could add a tamper sticker to it. Over in the buyitforlife section of Reddit, someone was looking for a high-quality option that would be weather resistant. He was looking to help to secure down a ladder outside so it would need to be able to withstand harsh and inclement weather. The top advice came from somebody that said that it’s not worth paying too much for one because they don’t provide true security if a thief is determined to steal your ladder. His recommendation was to visit your local hardware store and purchase an option with a thick shackle because that would provide the best protection at the lowest cost. On the other hand, if you are looking for a higher grade level of security that would be pretty hard to saw through or cut, he recommended Medeco shrouded padlocks. Another user offered some surprising criticism of Master Lock, saying that the majority of them can be popped right open with correctly placed hammer strikes. A professional locksmith suggested the Ace Hardware brand locks with a brass body. There was even a person that advertised themselves as an ‘urban asset liberation specialist’ – in short, a thief. He said that the majority of padlocks are merely an annoying deterrence and not true safeguards of material possessions to a dedicated thief.